Sometimes new authors impress me so much with their debut that I become a fan for life. I called Merrie Haskell's The Princess Curse "a must-read for anyone with a bent towards fairy tale or historical fiction," and I've anxiously awaited news of her forthcoming books ever since. I'm reading 2013 release Handbook for Dragon Slayers for the CYBILS, but Haskell has another book on the horizon already, and it got a blurb from Robin McKinley. WHO IS ONLY ONE OF MY FAVORITE LIVING AUTHORS EVER. Needless to say, I'm excited and happy and extremely impatient to get my hands on it. 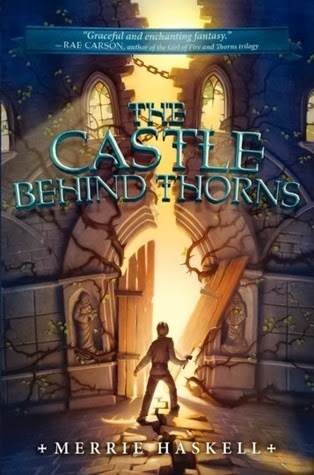 Merrie Haskell's The Castle Behind Thorns will be released by Katherine Tegen Books (HarperCollins) on May 27, 2014. Wow, this one sounds epic! Like a big, huge chunk of fantasy! Certainly am looking forward to this, as well now!!! I'm looking forward to this one rather a lot myself!